This season we saw a number of baby mama’s walk down the aisle to their baby Daddy’s. The kids are cute, but make no mistake, getting married with kids in tow is not always easy. 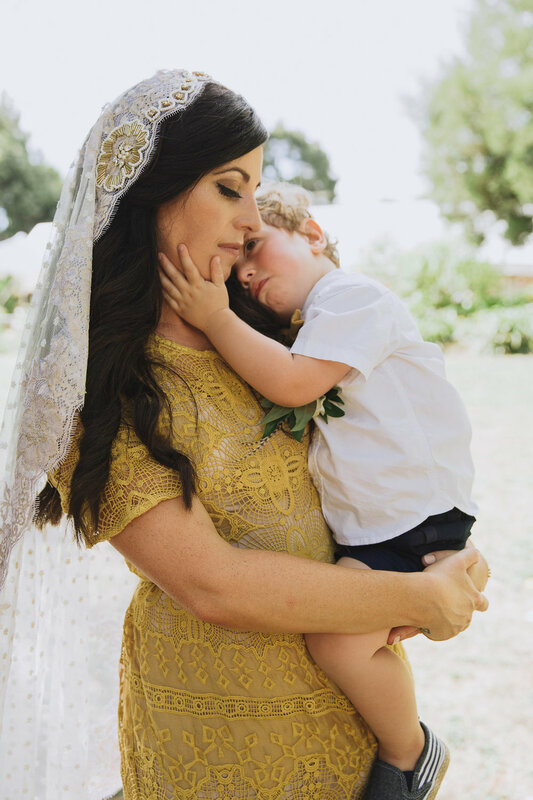 We asked three of our brides about getting hitched with kids, their advice on including the kids on the day – and how to survive. 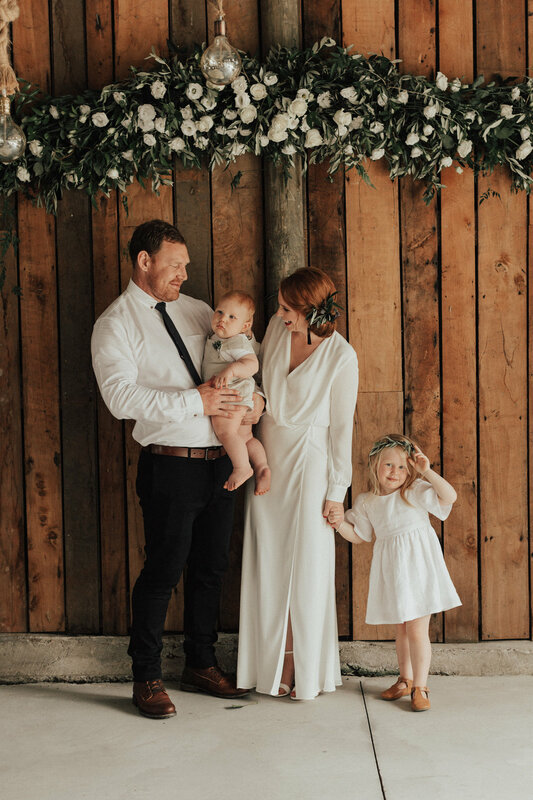 Last week we spoke to Rebecca Keil, and this week we have asked two more of our beautiful brides, Kensie & Jane, to share their experience of getting married with children in tow. 1. One thing I noticed on both of your wedding days was how involved your kids were, it was so special! They were such a big part of your day and it was lovely to see. Was it always a given that they would be there and involved? Kensie: Yes absolutely. Warwick and I have been together for nearly 19 years and once we had the boys it felt right to get married as a family. We were already committed to one another, we saw our wedding day as an opportunity for the boys to hear us say lovely things about each other (which we often miss in the daily grind) and for all our friends and family to celebrate 'us' together. Jane: As soon as I got pregnant I had that crazy urge to just elope on the spot but those Frenchies LOVE their paperwork, plus it would have meant getting married away from our families which we really didn't want. So I guess we sort of always knew we would have the kids involved on the day. They are such a massive part of our lives and there is no way we would have excluded them, plus they are bloody cute so it's a win-win! 2. Tell us about your family unit, how many children you have and how old were they when you got married? Kensie: We are a family of four from Wellington. We got married this year on January 13 at Waihoanga Centre overlooking the river in Otaki. Our two boys are Zephyr (6) and Cuba (2). Jane: We have a little family four. Myself and my husband (hehe) Aled, our daughter Olivia and son Eddy. At the time of our wedding Liv was three, and Ed was the ripe old age of 9 months. 3. How did you involve your kids on the lead up to the big day, and the day itself? Kensie: I proposed to Warwick when Cuba was about 8 months old and Zephyr was 5. They were involved in the proposal, so were involved from the beginning. We talked about our wedding day, told them what we were doing. Zephyr asked if we were going to kiss and wasn't too sure about that part. While they may not of understood fully, they knew that mum and dad were going to say what they love about each other and that all our friends and family were going to celebrate with us and they were super excited about that! We never wanted to put any pressure on them so any 'roles' were decided on the day. You never know how your kids are going to react in a situation, especially when all eyes are on them! so we never told them that had to do anything as we didn't want to create that pressure. I had in the back of my mind that I wanted Zephyr to walk me down the isle and as the music played before I walked down the celebrant asked him if he wanted to go and get his mum and he ran to get me. It was perfect. It did help that Warwick had Jet plane lollies in his pocket too as incentive. We also had planned to take them with us for the photos, but with all the excitement we made the call it would have been too much so flagged that. Oh and we dressed them up of course! Jane: In all honesty the kids were too young to really understand what was going on. Liv knew we were having a big party with all our family&friends, and that she was wearing a little dress with some flowers so she was PUMPED! The week leading up saw us mucking about at the venue a fair-bit, however the kiddos were left at home with Nana&Peppi (lifesavers!) The day before the wedding I did actually take my little lady for a mani-pedi. I hear these are supposed to be very relaxing.......it was not. I am not sure if you have tried this before but she was hard work, however it was a sweet little moment to share with my girl and I am really glad I did it. That night my bridesmaids came over and we all had dinner together, we chucked the kids in the outside bath and the boys all turned up for a bit of a drinky before bed-time so it was nice for everyone to get together! The day of was pretty much more of the same, the kids were there with us just hanging out and it was a lot of fun. We wanted to include the babes in the ceremony so had them standing up there with us and we wanted them to have a special little part to play. I'm not really a fan of the unity candle mixing sand thing, so we just got the kids to hold the wedding rings and when it was time to do the ring exchange they each handed us a ring (Liv handed me her Daddy's ring and Eddy handed Aled his Mummy's ring). It worked well for us, and was a really beautiful moment that I still often think about. 4. 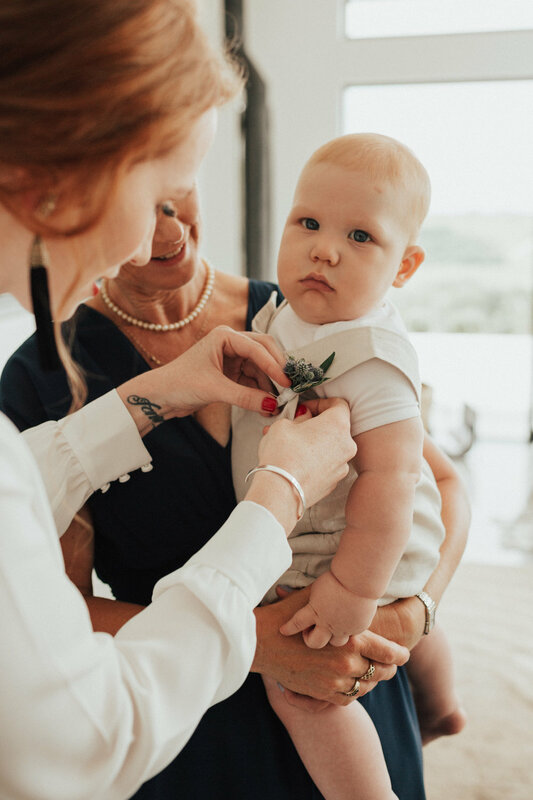 Organising a wedding when you’re a baby mama has got to be hard, do you have any advice for other brides to be in the same position? Kensie: In the lead up I made sure the boys knew what they were wearing and they helped pick out the outfits. This helped as they had ownership of it and they hopefully were less likely to protest on the day and be excited about their clothes. On the day we were lucky the boys had cousins to hang out with, so family help was so important with naps, food and bed times.I don't think it would have been possible without them. I also had to let a lot go and try not to sweat the small stuff and trust that they would be take care of. Jane: I may be speaking out of turn here, but I have to believe that if you are a baby mama and planning a wedding, the sort of wedding you are planning is probably not the same wedding that Suzy from spin class is planning.. I am not saying that you have to give up on the glitz & glam BUT you need to be realistic. If you want to have your babes involved make it easy on yourself and keeps things casual, and don't be afraid to ask for help! Of course, this all really depends on how old your kids are! 5. Your own kids is one thing, but were other peoples children invited to your wedding as well? If not, how did you word this on your invite? Kensie: We had our kids, my nieces and my cousin’s kids and that was all. On the invite we addressed it to only to the parents, so it was implied. I had always thought kids would come too and was never against the idea, but our venue had a limit of 80 people so this was not possible, so if anyone asked we told them this and they understood. Most of our friends also live up north so we thought they would appreciate some time away from the kids and they did! Some of our friends travelled with their children and other family and turned it into a mini holiday, they just didn't bring them on the day. Jane: This was something we really agonised about. Honestly, it took us a week to find the right words to say because we wanted everyone to know their kids were MORE THAN welcome, especially because ours were going to be there! On the other hand, we really wanted everyone to be able to let their hair down and get a bit wild. So we ended up letting everyone know what our plans were with our kids (hanging out till the party starts) and then offered to try and help where we could with babysitters etc. 6. Was there anything you did on the day itself that was a life saver that you would recommend others do OR something that you wish you hadn’t done? Kensie: I think what made our day relaxed and the children relaxed was that they felt a part of it and didn't feel pressured. If they cried, wanted to be held or talk to us during important bits like the ceremony we were ok with that as it was about them too. I told family not to hush them, or take them away, to just roll with it. We were always available to them. Besides I knew it would make great photos if they did! After the ceremony we had a grazing table so the kids went nuts on that and we had a burger truck come so we made sure that did a 'kids' burger to cater for them, we also arranged to feed them early and first. It was easy. Bed time didn't exist either...it was one day/night where the routine went out the window as it was a special and excited time for them, one I'm sure is locked in their memories forever. Jane: Baby Mama's I'll say this once, and once only, get yourself a DAY-OF-COORDINATOR! Trust me on this. It was potentially some of the best money we spent. It allowed us to just be able to chill out a bit, get some photos done, get the kids naps in, EAT etc without stressing about who's going to be able to get back to the venue to meet the food truck and help set up the flowers and band etc. Also, photos before the wedding worked really well for us, it gave us the opportunity to time photos with our babes before they went off for their naps, and lets be honest, while they were still looking cleanish HA!. This is without a doubt the number one question we get asked - so we've put together the ultimate guide to help you with buying alcohol for your wedding, tips on your wedding bar and how much alcohol you really need.